Dave's Meat & Nuts is a brand that launched in January 2015 after raising funds on Kickstarter last November. We published a review back then, but withheld ratings until the company went live. The company is the brainchild of Dave Gadlin, who had spent a great deal of time working in New York City with some of the country's best chefs and restauranteurs. He took his expertise out to Napa, CA to focus on his two biggest snack food passions, jerky and peanuts. Dave claims his jerky to be smoked in a real smokehouse. This "Classic Smoked Dry" beef jerky is compared by Dave himself to other great classics like The Beatles, Julia Child, a '57 Chevy, and Neil Armstrong. The first flavor to hit the palate is a light saltiness. The chewing brings on a little bit more salt, along with touches of natural meat flavor, and traces of black pepper and other seasonings. For being described as "Classic", it holds up. 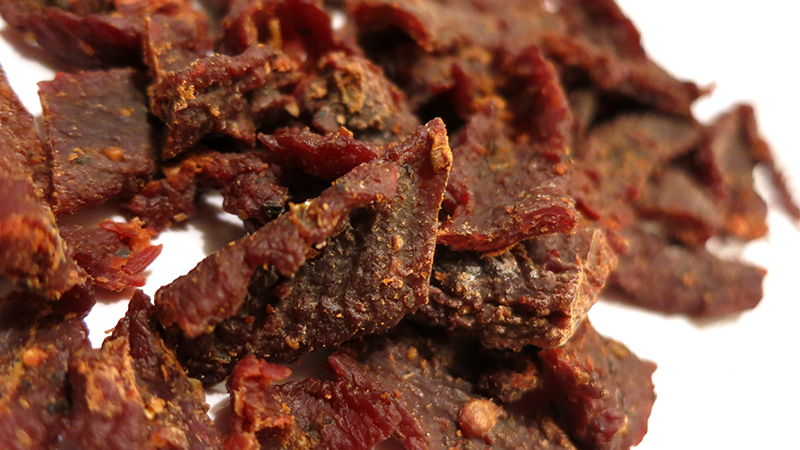 I mean, it has that simple flavor that many "old fashioned" style jerky brands offer, but it comes in light amounts. The despite the company claiming this jerky to be smoked in a real smokehouse, I don't taste any smokiness at all. 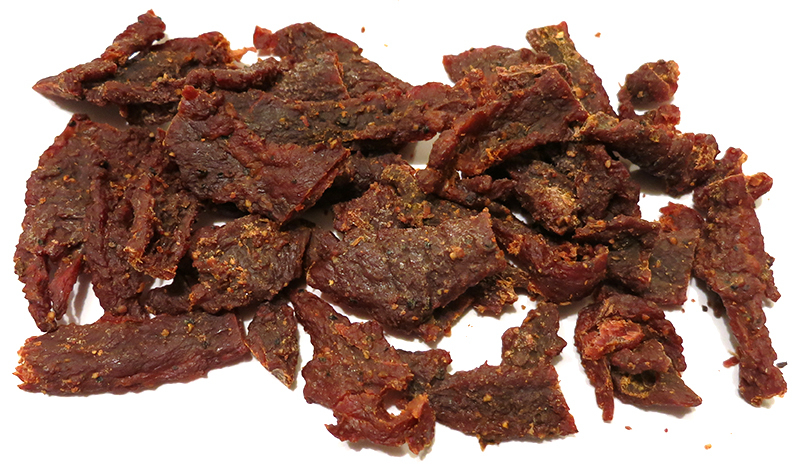 The flavors that seem to define this jerky overall is a low-to-moderate saltiness, with a light black pepper seasoning, and faint bits of garlic and onion. There's also a light natural meat flavor that raises its head towards the end. There actually is a light bit of heat to this, but light enough that at best it registers a "mild-medium" on my personal heat scale. I think most of it comes from the black pepper as opposed to the jalapeno. The meat consistency seems good overall. It's dry and moderately chewy. It has a meaty feel, and often has the resemblance of pound steak, once chewed down soft, though more crumbly. There's minimal stringiness. 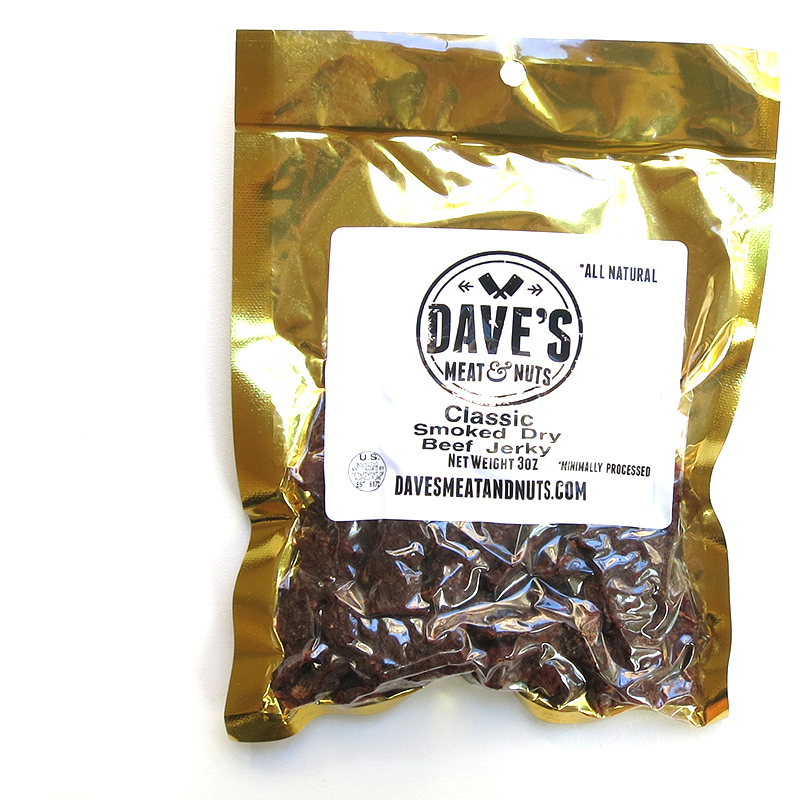 This "Classic" beef jerky from Dave's Meat & Nuts offers an old fashioned style jerky flavor, where simple flavorings of salt and seasonings help bring out the natural meat flavors. But in this case, the salt is largely the dominant flavor, and the seasonings add only light swashes of color. The natural meat flavors are still rather light. Despite the labeling to say, "Smoked", and the company's website claiming its smoked in a real smokehouse, I wasn't able to detect any smokiness. The meat consistency, however, seems good, dry and chewy, with mostly all meat, and minimal stringiness. The chewing texture seems good, feeling just like real meat, though not quite like real chunks of steak.